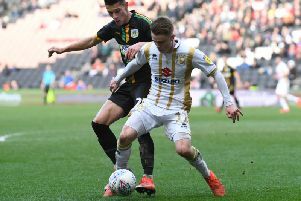 Stuart Moore does not want to risk the wrath of Paul Tisdale by refusing to be substituted like Chelsea's Kepa Arrizabalaga. The Dons keeper said he did not know what to think when the Chelsea stopper remained on the field after his number was held up on the fourth official's board late in Sunday's Carabao Cup final defeat to Manchester City. The world's most expensive keeper was later fined and dropped by Chelsea, and Moore admitted he would not like to think what Dons boss Tisdale would do if he considered a similar stunt. "I don't think he would have been too happy!" said Moore. "I've never seen anything like it – I didn't know what to make of it. Obviously, he has just played 120 minutes, kept a clean sheet and felt he deserved to stay on but at the end of the day, it's the manager's decision. "If your number comes up, you have to come off and discuss it afterwards. It was not the right time to discuss it there, but no-one has been in that position before, it's a big thing."